My field notes for the Finding Bigfoot expedition to Michigan's Upper Peninsula have now been published. The field notes include other photos from the site, as well as an in-depth discussion on a possible cause of bigfoot eyeshine. A footprint in the snow possibly left by a sasquatch in Kansas. Kansas seems an unlikely place for bigfoots to be found, yet there are a small number of sightings. These sightings are from areas of suitable habitat, and are reported by seemingly credible people. 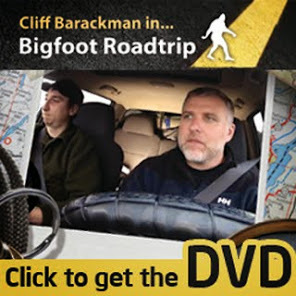 The Finding Bigfoot team went to check things out, and my field notes from this expedition have now been published on my official website. Click here to read my field notes. My field notes for the Montana expedition have been posted to my official website. You can look forward to others coming in the next week or two, so check back often. Click here to read the Finding Bigfoot Montana Expedition field notes.